Independence Day reminds us to appreciate the freedoms we enjoy in this country, especially the freedom of speech. Where would writers be without the free exercise of speech? Enter Goodreads Giveaway by 7/20 for a chance to win a free paperback version of Mystical Aria: Seeking the Gallion Queen. Click the "Enter Giveaway" link below for details. Good luck! Giveaway ends July 20, 2016. Lela Markham, author and blogger from Alaska, interviews Jean Neff Guthrie. What would Jean do if she were dropped into a remote Alaska cabin for a month? This blog contains photographs from the Gallery Show at the Decatur, Georgia Library on May 27, 2016. 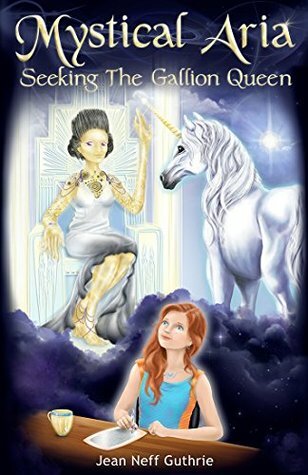 Congratulations to Michele Phillips, illustrator of Mystical Aria: Seeking the Gallion Queen, for her invitation to display this book's cover design in the Gallery Show. The event was conducted in conjunction with the Decatur Arts Festival's Art Walk. What better way to spend a summer day than at the lake with a good book. In this gallery blog you will see photographs from a book signing at the Claytor Lake Festival on June 11, 2016 in Dublin, Virginia. Sponsored by the Fine Arts Center for the New River Valley. "The story is well written for a seventh grader reader. I think they will enjoy the adventures of Aria meeting aliens. The dialogue is realistic for this age. The descriptions of the Gallions are entertaining and believable." "The story is a well-executed plea for readers to think about their approach to living. An alien culture comes t o teach us many things about the way we see our world. It makes a point that if we view the world as one of scarcity then we will know scarcity. If we view the w orld as abundant, we will know abundance. It tells us that we make our world by what we project, abundance or scarcity. The first place we have to heal is in ourselves, then we can heal our relationships and Earth." "What an enchanting adventure! I know it's a young adult, teen read but at 66 I thoroughly relished it--aliens, space craft, kids, SEALs-- a young adult plot, well written with a wonderf ul 'just beginning adventure' ending . . . can't wait for the next one!" As a kid, I loved playing with sparklers on the 4th of July. My favorite part of the holiday was lighting up the sparklers and chasing our cats around the yard. I got a big kick out of it, but I don't think the cats appreciated the excitement. First draft of book two in the Mystical Aria series has been delivered to the editor. The novel is a compilation of Aria's diary entries while she's on the alien superspaceship in book one, going through daily challenges to meet the alien queen. Following are the draft opening paragraphs, written from Aria's point of view. Hi, Aria Vanir here, somewhere among the stars. These are my writings aboard the Gallion Superspaceship, Rama XI, during my journey to meet their Queen Supreme, Nashata. Since I left my transmission diary back in Virginia Beach, the Gallions gave me one of their crystal scroll recorders. Peakte programmed it to auto correct in English. When I asked him for a pen, he gave me this astro laser pointy thingy that glides way better than my tPen. Now I have a way to write about my feelings and reactions during what has become my most adventurous summer vacation. School year 2027-2028 has ended, and Aria looks forward to surfing and wave-running at Virginia Beach. Will her secret crush, Drake, notice her? Will the good aliens-Gallions-who contacted Aria through her tDiary come to visit during the summer? Next time, more blogs from Aria about her summer adventures.